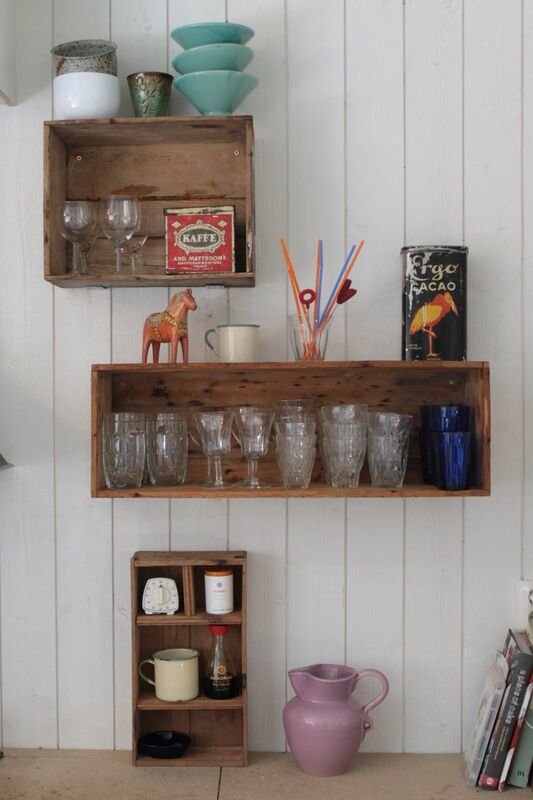 I just love the worn out, simple and cheap idea of making shelves out of old wooden crates. The ones on the left are from Dellas room and the other one is from our new kitchen in our cottage. the kitchen is far from ready but slowly we are getting there. We don’t have a kitchen top yet – it will be concrete. that was trown out in the 70′ but are still in the barn in our yard. Behind the big painting is a hole – for a window so we can cook and look out on the woods! and more from the “before house” – here. I simply found these old crates in the barn. Old sugar, butter and fruit boxes. 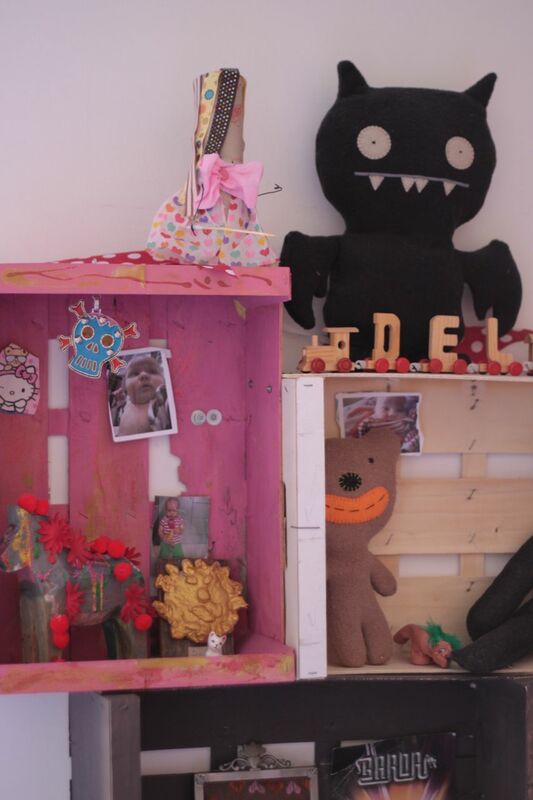 In Dellas room I used fruit crates from the market place. Like I did in Hadichas room for Fixa rummet. They are really cheap, got them for free! 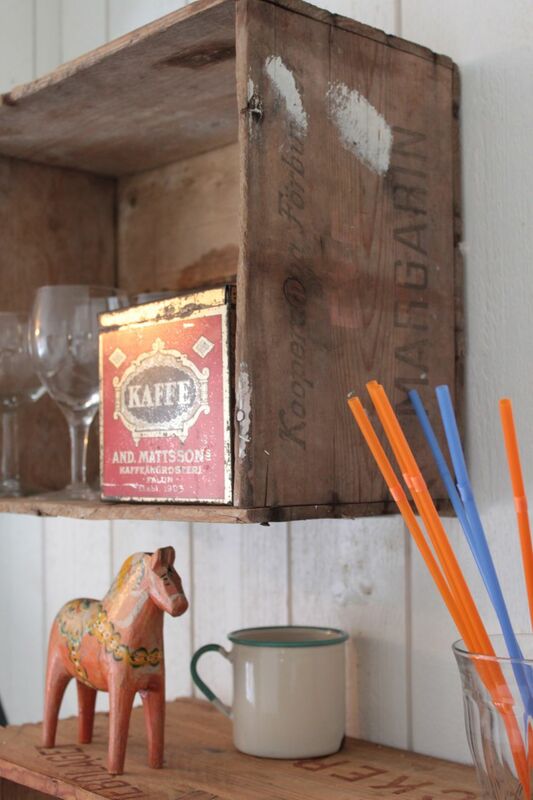 Altough not so strong, I like the simple bric a brac feel to it. We painted them with left over paint. Newer Post Bean bags	Older Post Womens day and Semel day. Two makes perfect. Isabelle! I love this. 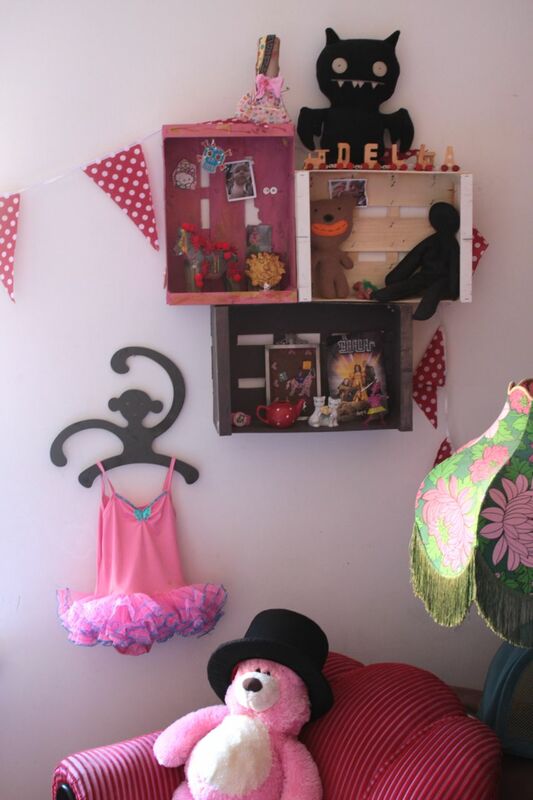 I will do this in Viola´s room and her playhouse as well!! These look really lovely in your kitchen. Like you I was lucky to find some in our barn too. 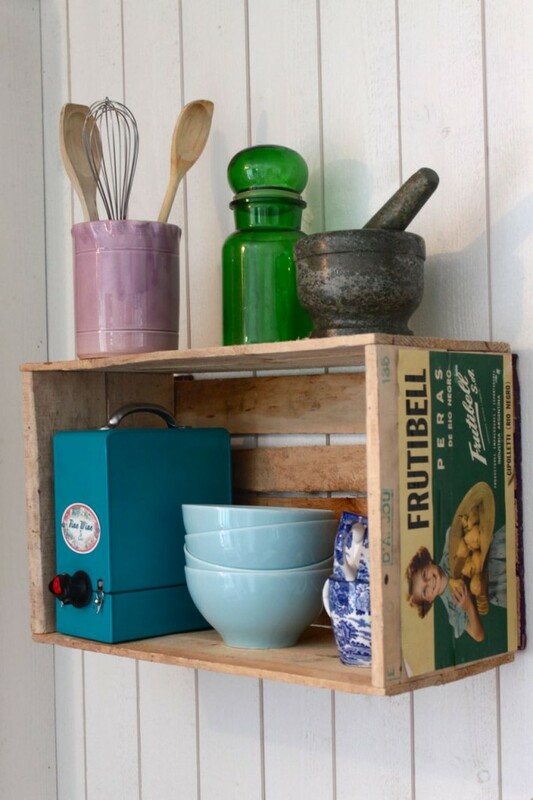 I am hoping to you’s them as shelves in my son’s bedroom…a couple of old ammunition boxes/crates I have used as a bedside table… quite macho in a teenage boys room lol! thank you for this post! I have been in love with crates, cubbies, shelves, etc. since I was a child. (even in school – a few desks had cubbies instead of tops that lifted up and I wanted one so badly but was never assigned one)… I love crates as shelves and your post has encouraged me to find a way to get my crates up onto the wall of my apartment! The kitchen allready looks way better than before, good choice to make a window in there! Can’t wait to see when it’s done. I’ll bet it’s gonna be spectaculair! Good luck! An old idea that still works I guess. I can’t wait either to get the kitchen going. This summer I gues or hope it’s going to be finished! 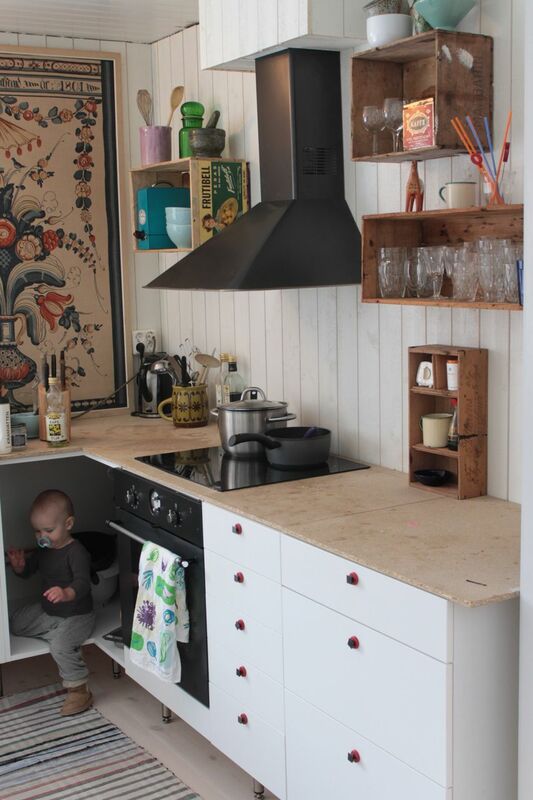 I dont have a barn to find old crates – I live in the city and would like to find some crates for shelving in two fireplaces I have in my kitchen. Where can I buy them does anyone know?